In support of crowdfunding our new anthology of poems, No One You Know, with Unbound, Sue Dymoke and I are starting a series of blog posts about anthologies which have influenced us as readers and writers. 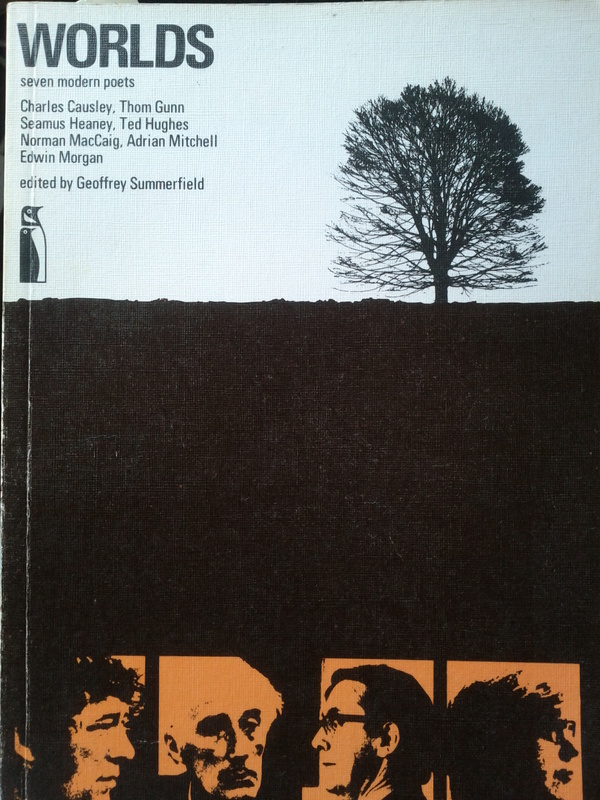 Below I discuss Geoffrey Summerfield’s classic Worlds: Seven Modern Poets (Charles Causley, Thom Gunn, Seamus Heaney, Ted Hughes, Norman MacCaig, Adrian Mitchell, Edwin Morgan), Penguin Education, 1974. We would be interested to know which anthologies got you, our readers, going. An earlier version of this piece first appeared in The North. Geoffrey Summerfield’s Worlds is one of the most important books in my life. I look back on buying it as the moment I became a reader of poetry for myself, as distinct from one fashioned by reading required for school. It was the first book of poems I bought with my own money and the first I read for my own pleasure. I still read it, and look at it, frequently. And reading and looking is what Worlds is about. It is not just an anthology of ‘seven modern poets’, it is also a gallery of great photography. When I first picked up the book, and this is still chief among my pleasures now, I felt I was being introduced not only to good poems, but was also being offered a snapshot of the lives of the people who wrote them. I’m not aware of another book like it, the way you encounter first photographs of scenes of poets’ lives, their houses, neighbourhoods, rooms and desks, then an essay by the poet about his work and writing, then the poems themselves. If I was given any amount of money now by a publisher to make just one book or series of books, I’d model it on Worlds. Exquisite black and white photography, plain-speaking essays, and well-made selections of poetry, ‘handsomely produced’: the world still needs such books. Penguin: what are you waiting for? Like all good anthologies, Worlds refines tastes you already have, and gives you ones you never knew existed. Into the first category I’d put Hughes, Heaney and Gunn, who I had read a bit at school, but not much, and into the second category Causley, MacCaig, Mitchell and Morgan. Ted Hughes was where I started. Funnily enough I have only recently noticed that he is alone in the book in being the only poet not to feature in one of the book’s photographs. It doesn’t matter: his presence is stamped on every page of his selection, Fay Godwin’s photographs showing us what we intimately know as Hughes Country: sheep grazing on an empty moor; a fox carcass weathered by rain; a house perching precariously next to dry stone walls; a graveyard. His essay seemed remote and strange, not at all chummy: ‘To me –no matter what metaphysical persuasion or definable philosophy a poem may seem to subscribe to- what is unique and precious is in its heart, that inner figure of stresses.’ I wasn’t sure what he was talking about, but found it mysterious and compelling all the same, sure that I knew I wanted to know more about it. By contrast Norman MacCaig’s section, which directly follows Hughes’s, is companionable and cosy. I love the tone of his essay (‘As far as I know, I’m the only MacCaig ever to have committed poetry’), the way it appears to be like someone talking to you, but asking important questions at the same time. Much like his poems in fact and not as simple as it sounds: ‘Useful? It’s easy to see that chairs some in handy. But what use is poetry?’ This is of course one of the big questions, but if MacCaig lost any sleep over it you wouldn’t know it from looking at the photographs of him (by Larry Herman). The opening page of his section is a series of eight quickly taken photos in a pub, with MacCaig in various poses (although they aren’t posed) of laughter, conversation and thoughtfulness, a cigarette never far from his hand. Just like a human being in fact. Other shots show him lighting up, sitting pensively, about to inhale, in his (extremely tidy) flat, talking with farmers at a country show, and playing fiddle in a back room. Here was a person who did things, only some of which was writing poetry. And I think that is Worlds’ great gift and message, that it portrays poets as people first and poets second. This comes across in the snippets of autobiographical material in their essays, Thom Gunn, for example, describing the way his eyes had once met those of a ‘rather pretty girl’ on the Tube: ‘She was probably merely observing the state of my acne, and of course I never saw her again, but that was all to the good, since I could now imagine her whatever I wanted.’ Living in London’s outer suburbs, this was a world I also knew. To have it described so clearly came as a revelation. The crucial thing is that a connection was being forged from what I knew to the world of poetry, where it seemed accepted practice to hunch over pages of manuscript on the floor (Adrian Mitchell), or stand surrounded, performing in pubs (Mitchell again); where they filled studies with books and pictures (Causley, Gunn, Heaney and Mitchell), or just seemed to spend a long time looking out of the window (Morgan). 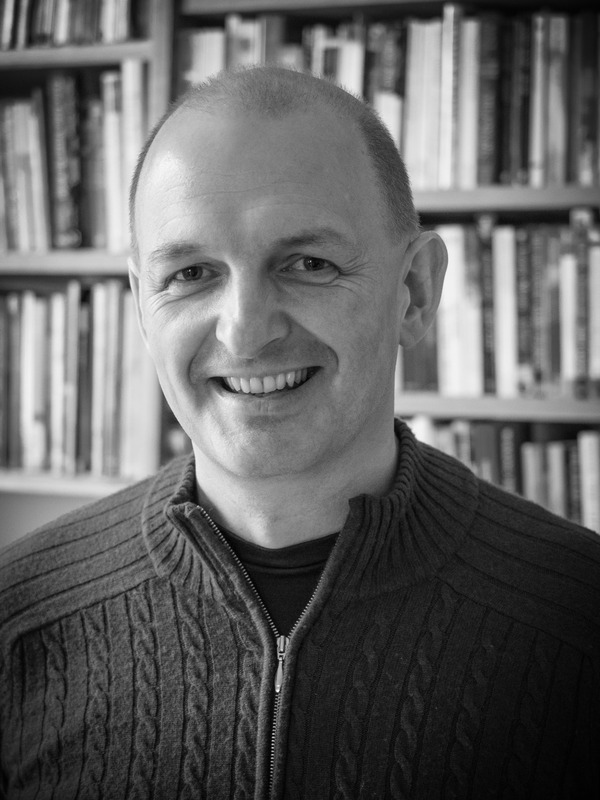 Worlds treats its readers, ‘the younger adult who wants to move more deeply into contemporary British poetry’, very seriously, and does not talk down to them, neither in the essays of the individual poets, nor in the selections of poems chosen. Stylistically it ranges from the tightly metrical forms of Causley to the concrete poems of Morgan, the anthology’s first and last authors respectively. In terms of landscape it is very catholic indeed, combining both the rural ‘Cornish jungle-country’ of Causley and Heaney’s farmsteads and bogs with urgent depictions of urban life from Edinburgh and Glasgow to Vietnam and San Francisco. Along with the big themes of love, war and death there are poems about space, jazz, horses, snails, being gay, rivers, Jefferson Airplane, and hospitals, among much else. It contains a half dozen, perhaps more, of poems I return to more than often, and always with surprise, even though I have known them for years, including: ‘Aunt Julia’ (MacCaig), ‘Autobiography’ (Gunn), ‘Wind’ (Hughes), ‘One Cigarette’ (Morgan) and ‘Digging’ (Heaney). It has influenced me enormously, portraying poetry as a kind of truth telling about where you are from and refracted through experience, including travel and reading. In the late 1970s I lived in Turkey and came across the ‘Penguin Book of Turkish Verse’ edited by Nermin Menemencioglu, who I subsequently met back in London. This anthology of Turkish poetry through the ages bowled me over – such a different tradition to the poems I had previously read in the UK, so elegant and clever and heart-felt. My particular favourites, whose poems I go back to time and again, were Nazim Hikmet and Cahit Kulebi. More recently, Sean O’Brien’s ‘The Firebox’ and the Bloodaxe ‘Staying Alive’ trilogy have introduced me to some wonderful poems. In fact, don’t get me started, there are so many brilliant anthologies that I have learned from and enjoyed. The third is/was ‘The New American Poetry’ edited by Donald M. Allen. All exciting and influential and beyond my ability to emulate, hard as I tried, reading and writing by their light aged 15/16+ at the end of the 60s and into the 70s. Thank you, Anthony. Can’t wait to add some names and poems to my resources for upcoming poetry workshops. Poetry is alive and well in San Diego. We now have the Kowit Prize for Poetry to honor well-loved poet, Steve Kowit, who passed away a few years ago. I was fortunate enough to win the Prize the first year (2016) and now encourage others to enter the competition. The light of poetry still shines! I hope you are well and still writing your own poems. Many thanks for the wonderful introduction. In the late 50’s (I’m sure it was when I was at primary school) we were introduced to an anthology which included Hughes and Causley and a couple of other poets, one was a woman, and it was that book that moved me to write poetry. I’m now 67 and I’ve never found out which anthology it was that started me off. I will see if I can find Worlds online and order a copy! I remember attending a lecture (on John Clare, I think) by Geoffrey Summerfield at York in the late 70s – and that he was a very warm, enthusiastic presence. From my own schooldays in the early 70s I remember a wonderful anthology entitled Dragonsteeth – beautiful cover and illustrations. As a young English teacher, I loved Touchstones (Michael and Peter Benton) – again, lovely photos as well as exciting poems and imaginative creative prompts for the pupils. More recently, Blood axe Staying Alive and Ruth Padel’s 52 Ways of Looking at a Poem – for both the poems and her thought provoking commentaries.